Now it's Mayor Dawn Zimmer in 2017 throwing-in to get Ravi Bhalla mayor. 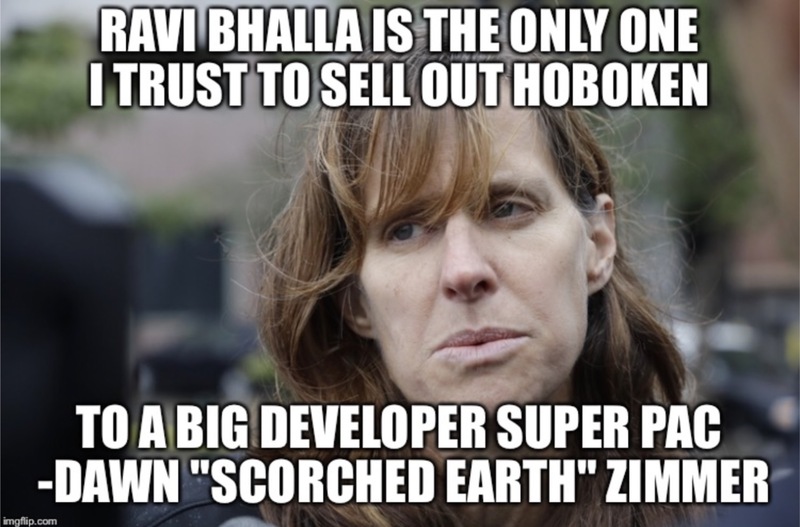 She likely knows all about the massive union of operating engineers backing PAC monies in Hoboken and its deep connections to NJ Transit's proposed billion dollar towers and massive redevelopment objectives in downtown. NJ Transit wants a 70 story commercial tower surrounded by 42 story towers in downtown Hoboken. Now it's a Zimmer surrogate in Ravi Bhalla who is benefitting from these mega development players. The union's PAC, Stronger Together is spending over $50,000 to see Ravi Bhalla elected. Local 825 can smell the maximum buildout so much they can taste it. That kind of investment using an outside PAC in Hoboken is not incidental nor coincidental. It comes with high expectations. Talking Ed Note: Earlier this morning MSV asked for comment from both Mayor Zimmer and the Bhalla campaign on the stunning reversal about outside PAC monies flooding Hoboken. In 2009, Mayor Zimmer was so adamantly opposed to it, she sought City attorneys to investigate it as a violation of "pay to play" laws. Now a festering wound is open with the NJ engineer union flooding the zone spending tens of thousands of dollars on behalf of Ravi Bhalla's campaign on cable TV ads seen in heavy rotation and two separate mailers costing over $50,0000. 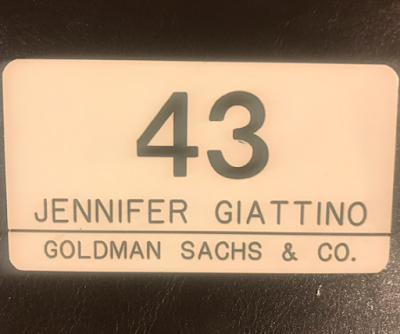 The online campaign by the Bonkers for Bhalla Brigade continue their sexist assault on Jen Giattino's professional career on Wall St. Apparently, even an actual NY newspaper photo seen earlier on Facebook showing a tumultuous day on the New York Stock Exchange with a clearly visible Jen Giattino in the mosh pit of traders wasn't sufficient evidence. After two years inactive, a broker's license is invalid. This the loons say is evidence Giattino's Wall St. career didn't happen. The cave dweller rabble are continuing their sexist attacks led by the head loon there and elsewhere. They also are 100% ok with the $50,000 PAC money invasion in Hoboken now. 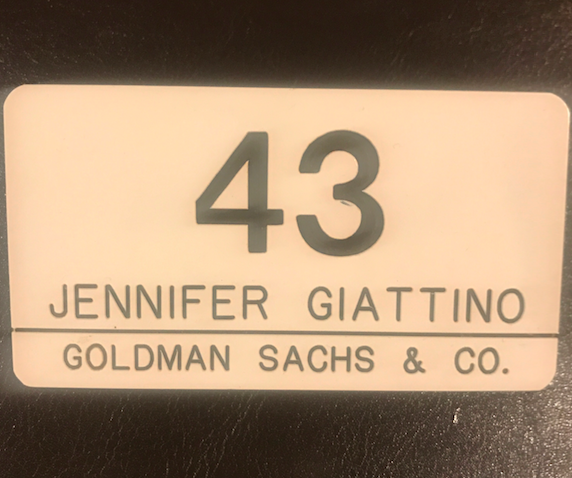 Actual Goldman Sachs badge issued only to employees who are brokers and specialists. professional career to demean and smear her.